"On a pair of golden crouching lions rested the throne, many steps above the gleaming floor. And it was wrought of one piece of ivory, though no man lives who knows whence so vast a piece could have come." "When Dr. Trask, the anthropologist, stooped to classify the skulls, he found a degraded mixture which utterly baffled him. They were mostly lower than the Piltdown man in the scale of evolution, but in every case definitely human. Many were of higher grade, and a very few were the skulls of supremely and sensitively developed types. 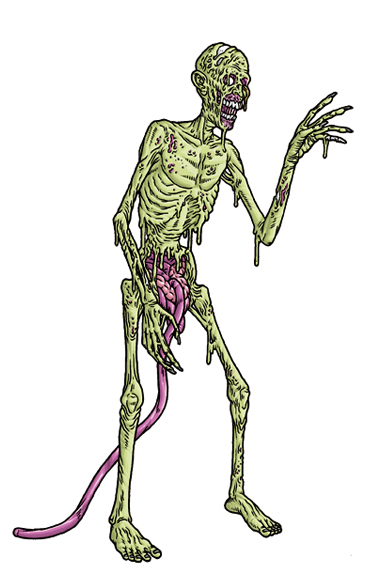 All the bones were gnawed, mostly by rats, but somewhat by others of the half-human drove." "Horror piled on horror as we began to interpret the architectural remains. The quadruped things—with their occasional recruits from the biped class—had been kept in stone pens, out of which they must have broken in their last delirium of hunger or rat-fear." "I beheld in full, frightful vividness the inconceivable, indescribable, and unmentionable monstrosity which had by its simple appearance changed a merry company to a herd of delirious fugitives." "I cannot even hint what it was like, for it was a compound of all that is unclean, uncanny, unwelcome, abnormal, and detestable. It was the ghoulish shade of decay, antiquity, and desolation; the putrid, dripping eidolon of unwholesome revelation; the awful baring of that which the merciful earth should always hide. God knows it was not of this world—or no longer of this world—yet to my horror I saw in its eaten-away and bone-revealing outlines a leering, abhorrent travesty on the human shape;"
"178-A very ancient tomb in the deep woods near where a 17th century Virginia manor-house used to be. 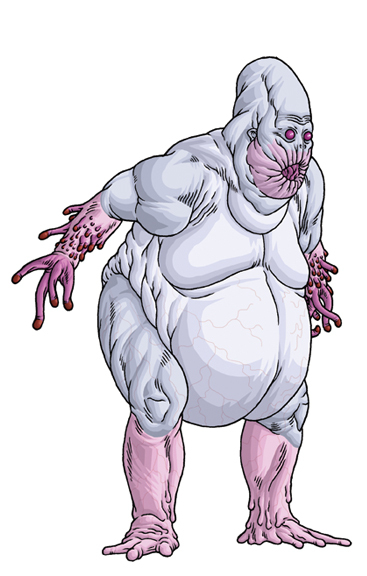 The undecayed, bloated thing found within." "Then one night in the dream-city of Zakarion I found a yellowed papyrus filled with the thoughts of dream-sages who dwelt of old in that city, and who were too wise ever to be born in the waking world." '“Iä! Iä! Tloquenahuaque, Thou Who Art All In Thyself! "The figure's robes and ornaments mark it as an ahua, or godking, but the Maya never drew or depicted figures with multiple arms. The two headed snake is the double-headed serpent bar, borne by Mayan kinds as a symbol of their authority. The blood-red tentacle in place of a head is very unconventional, but seems likely to be a blood scroll (a symbolic representation of a stream of blood), implying that this is a decapitated captive king." "Then he was a tall, limping man, with bright plumed headdress and a shining black mirror at his ankle. The Crawling Chaos said that in this mask he did rule at Tenoshititlan, and did drink the blood of thousands spilled to vilify him." Tloque Nahuaque: The Lord Of the Near and Nigh"
"During the Late Postclassic period, Tezcatlipoca may appear with a serpent foot, although in this case the serpent usually appears emerging from the smoking mirror that typically replaces his foot. The mirror or serpent foot probably aludes to the creation myth in which Tezcatlipoca loses his foot while battling with the earth monster. Aside from the smoking obsidian mirror marking his foot, the Late Postclassic Tezcatlipoca tends to have broad alternating bands of yellow and black across the face. The nocturnal jaguar, the most powerful animal of Mesoamerica, was the animal counterpart of Tezcatlipoca." "There are small bells on his legs, pear-shaped and round bells." "He was, from the top of his arms down to his hands, painted black with gypsum, which is a sort of shining metal...His legs, from half of his thighs all the way down, were dyed in the same manner." "The mask of the god Tezcatlipoca was made from shell, turquoise, lignite and human skull." 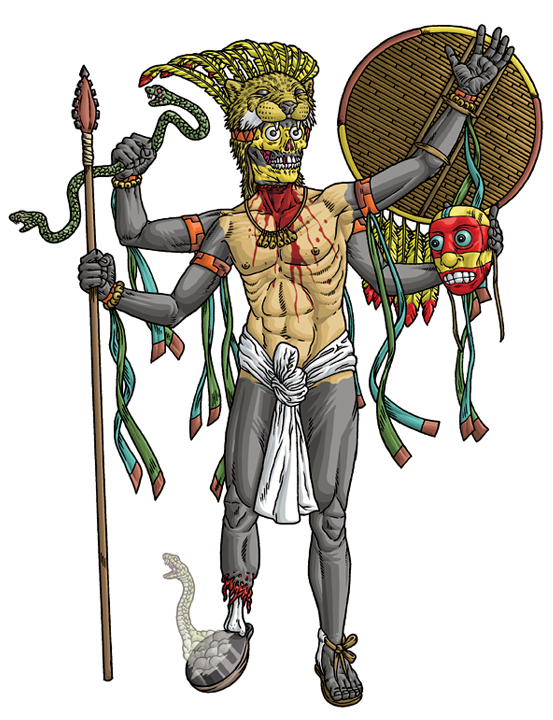 "A protean wizard, Tezcatlipoca caused the death of many Toltecs by his black magic and induced the virtuous Quetzalcóatl to sin, drunkenness, and carnal love, thus putting an end to the Toltec golden age. Under his influence the practice of human sacrifice was introduced into central Mexico." “O Nymph more fair than the golden-haired sisters of Cyane or the sky-inhabiting Atlantides, beloved of Aphrodite and blessed of Pallas, thou hast indeed discovered the secret of the Gods, which lieth in beauty and song." "Pallas was the Titan god of warcraft and the Greek campaign season of late spring and early summer. He was the father of Victory, Rivalry, Strength and Power by Styx (Hate), children who turned to the side of Zeus during the Titan-War. Pallas' name was derived from the Greek word pallô meaning "to brandish (a spear)." 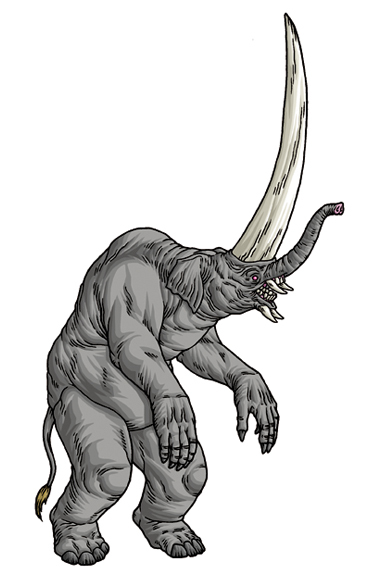 "Pallas was clearly imagined as a goat-like god. In the story of the Titan-War, Athene vanquished him in battle, and crafted her stormy aigis (goat-skin) shield from his skin. 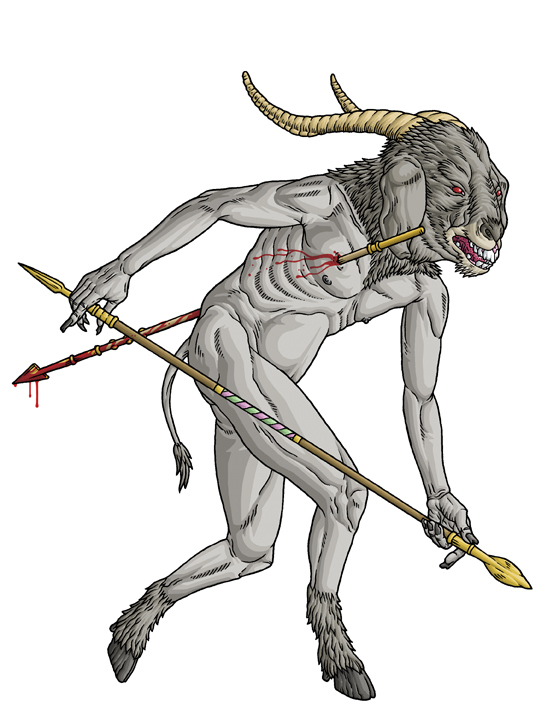 His father and brothers were also apparently animalistic: Krios, named simply the Ram, was probably the constellation of the same name (Aries); Astraios, father of the horse-shaped wind-gods, may have been assine or equine; and Perses, father of Hekate, was perhaps dog-like god." "The Gods are patient, and have slept long, but neither man nor giant shall defy the Gods forever. In Tartarus the Titans writhe, and beneath the fiery Aetna groan the children of Uranus and Gaea." "Gaia (or Gaea) was the Protogenos (primeval divinity) of earth, one of the primal elements who first emerged at the dawn of creation, along with air, sea and sky. She was the great mother of all : the heavenly gods were descended from her union with Ouranos (the sky), the sea-gods from her union with Pontos (the sea), the Gigantes from her mating with Tartaros (the hell-pit) and mortal creatures were sprung or born from her earthy flesh." "Gaia was depicted as a buxom, matronly woman, half risen from the earth in Greek vase painting. She was portrayed as inseparable from her native element." "Besides nameless rites and human sacrifices there were certain queer hereditary rituals addressed to a supreme elder devil or tornasuk; and of this Professor Webb had taken a careful phonetic copy from an aged angekok or wizard-priest, expressing the sounds in Roman letters as best he knew how." "Torngarsuk is the chief and most powerful supernatural being in Greenland. He appears in the form of a bear, a one-armed man, or as a grand human creature like one of the fingers of the hand. Torngarsuk is invoked by fishermen and by the Anguekkoks (the medicine men) when one falls ill."
Ungava Bay in the Hudson Strait." "In Alaska, the wisest of the wise, Tungrangayak, is depicted with his body covered in circles or eyes with which he can see everything: 'My whole body is nothing but eyes...I look in every direction.'" To have the new arrival settled nigh." "First she drew near holy Kythera, and from there, afterwards, she came to sea-girt Kypros, and came forth an awful and lovely goddess, and grass grew up about her beneath her shapely feet. Her gods and men call Aphrodite, and Aphrogeneia (the foam-born) because she grew amid the foam, and well-crowned (eustephanos) Kythereia because she reached Kythera, and Kyprogenes because she was born in billowy Kypros, and Philommedes (Genital-Loving) because sprang from the members." "Venus and her son threw themselves into the river and there changed their forms to fishes, and by so doing this escaped danger." "Into the Euphrates River an egg of wonderful size is said to have fallen, which the fish rolled to the bank. Doves sat on it, and when it was heated, it hatched out Venus [Ashtarte, the Syrian Aphrodite], who was later called the Syrian goddess." "Antigonos of Karystos, in his treatise on Diktion, says that this shell-fish [the ear-mussles] is called ‘Aphrodite's ear’ by the Aiolians." "Shellfish were regarded as sacred to Aphrodite from the cockle-shell (in which she is depicted floating at her birth) to the mussel, clam." "In her pierced ears they hung ornaments of orichalc and precious gold, and adorned her with golden necklaces over her soft neck and snow-white breasts, jewels which the gold-filleted Horai wear themselves."